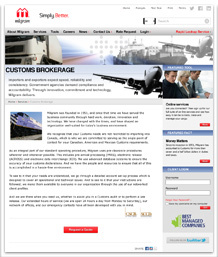 Milgram's IgnitionWeb-powered site serves hundreds of clients accessing up-to-the-minute customs, tracking, accounting and statistical information online. 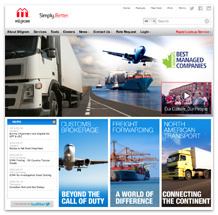 Canada’s largest family-owned Customs Brokerage, Transportation & Freight Forwarding company. HTC wanted to position Milgram as a market leader by raising their online profile to become an essential part of their customers' business operations. The "Simply. Better." slogan communicates their quality business practices and their ability to make complicated and critical information so easily accessible. The aim was to create an indispensable customer online resource through an information-rich website, using simple navigation and self-managed up-to-the minute communications capabilities powered by IgnitionWeb backend tools. Administration Manager, Content Status Manager, Media Centre, EasyText Editor, Membership Manager, Mailing List Manager, News Manager, Careers Manager, Document Distribution Manager, Links Manager, Site Statistics and Search Tools. Created and integrated a scalable Extranet to securely access three client legacy systems, and implemented a new "Track and Trace" system. Services Manager allows Milgram to administer their clients' access to multiple internal software applications operating on several different platforms, delivering a single sign-on solution. Promotion Tracking Manager gives the company the ability to assign special URLs for advertising purposes and track the effectiveness of each campaign. The IgnitionWeb e-business platform has improved and streamlined site maintenance, allowing Milgram to provide better customer service 24/7, increasing client satisfaction, and reducing operational costs (printing, mailing, customer service, IT, site maintenance). The sophisticated Milgram website has helped strengthen and grow their client base with up to-the-minute online updates (i.e. 9/11 Alerts) and productivity benefits provided by the customized single sign-on system. Their ability to tack promotions has given Milgram hard data on the results of each advertising campaign. This valuable insight has maximized their marketing efforts to drive traffic and improve click-through rates.